The Anabolic Diet by Dr. Mauro Di Pasquale is promoted to enable dieters to reach their fat loss goals without losing muscle mass. It has a strong following in the bodybuilding community although it could equally apply to any exerciser who wants to achieve their ideal physique. The Anabolic Diet is a low carbohydrate diet that alternates with periods of high carbohydrate eating. The basic concept is that you will turn your body into a ‘fat burning machine’ rather than one that uses carbohydrates as the major source of fuel. The initial phase of the diet is very low carb, which is designed to get your body into fat burning mode as quickly as possible. During this phase dieters may experience some uncomfortable symptoms such as dizziness, fatigue, and brain fog, which generally go away within 48 hours as the body makes the switch from running on carbohydrates to running on fats. For the first week of the diet carbohydrate intake is limited to 30 grams a day or less so as to ensure that the changeover happens as quickly as possible. Exercise during this week can also speed up the change from carbohydrate to fat burning. Once the switch over has occurred dieters then start to incorporate periods of eating high carbohydrates. The importance of this phase is emphasized because it is essential for optimal exercise performance. In general dieters follow the pattern of eating a low carbohydrate diet during the week and a high carbohydrate diet on the weekends. During the week dieters eat 55-60% fat, 30-35% protein and no more than 30 grams carbs per day. Di Pasquale claims that the diet doesn’t work if your fat intake drops to below 40%. Dieters are advised to eat 5-6 small meals daily and to always eat something when feeling hungry. Calorie intake is set at the equivalent of 18 times body weight. E.g. A 150 pound individual will start with 2700 calories. Dieters are given instructions to chart their progress and adjust calories either up or down depending on their goals. Chicken, fish, meat, cheese, butter, almonds, peanuts, tofu, diet soda, artificial sweeteners, low carb vegetables, fish oil, mustard, pickles, sour cream, Caesar salad dressing, sugar free jello. More healthy Low Carb Recipes can be found here. Exercise is essential for this diet and is recommended for its effects on increasing fat loss, improving cardiovascular health and enhancing general well being. These exercises that can be used as part of the Anabolic Diet. 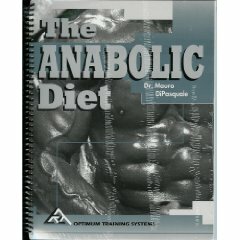 The Anabolic Diet is out of print and not easy to find in stores and copies of the book can cost $99.95. Also available by the same author is the Anabolic Solution which retails at $39.95. Effective for dieters who want to lose body fat and to maintain or even increase muscle mass. Provides an alternative to drug use for bodybuilders who wish to gain muscle. Reduces the experience of fatigue and impaired exercise performance that is common on continuous low carb diets. Provides sample menus for both 1500 and 3000 calorie diets. Frequent meals and variety in the diet structure may increase metabolic rate. Dieters are allowed to eat when they feel hungry. Safety of high fat diets is questionable. Some dieters do not do well on low carbohydrate diets. Alternating low and high carbohydrate intakes could severely disrupt glucose balance for sensitive individuals. Does not encourage the intake of fruit and vegetables. Extremely low intake of fiber and likely to lead to constipation. Meal plans are not very appealing and lacking variety. Recommends a variety of supplements including vitamins, amino acids, protein drinks, fish oils, evening primrose oil and antioxidants. Not good for athletes involved in high intensity exercise. Not easily adapted to a vegetarian diet. The long-term effects of this diet are highly questionable and dieters would be advised to seek a more balanced approach that will not place them at risk of health consequences in search of the ideal physique. this diet deffinately works well if done properly. in my experiance, strength, energy, and wellbeing all improve allot. also i never feel bloated except when i carb up. i reccomend 1-1.5 days carb up for fat loss. 2-3 days carb up for maintaining bodyfat and gaining muscle. Worked with this plan without exercising In November and December 2002. Dropped 22 pounds in 7 weeks and my blood work all improved. Worth a 4 week try but does require discipline and a game plan. wtf 5 eggs. who are u kidding.